For 16 years, Jeff and I created liturgy together with the feisty folks at Pilgrims. In our liturgical work, we learned to tell biblical stories by heart. We created beautiful, boundary-pushing liturgies, rooted in biblical texts and our Reformed tradition. 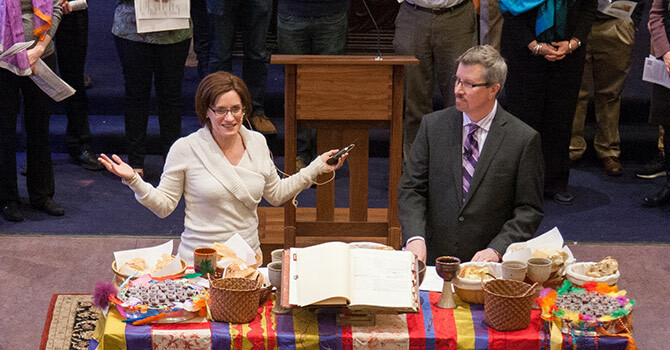 On Jan. 29, 2017, Ashley Goff and Jeffrey K. Krehbiel preside at communion during Krehbiel's final service at Pilgrims before moving to Chicago. Photos by Mike Morones. The lectionary gave us the story from the Gospel of John about the man who had been born blind. I preached that Jesus affirmed the man’s belovedness with mud, water and a holy welcome. The crowd and the man’s parents, on the other hand, kept their distance. The next day at Pilgrims, we honored Jeff’s life by weaving his spirit through our Sunday worship. We had flowers in the sanctuary from More Light Presbyterians, an organization working for the full participation of LGBTQ people within the PCUSA. We chanted Psalm 23, heard Acts 2:42-47 and its description of the radical acts of sharing in the early church and sang “Here Comes the Sun” with a new appreciation. Coffee hour that day was in the garden. In honor of Jeff, we also offered wine and scotch, including the “peaty single malt” he favored so much it was mentioned in his obituary.